Protect your data and prepare for future growth. I had the delightful privilege of moderating the FETC Virtual Conference this past May. One of the events was a Q&A with Elliot Soloway, of the University of Michigan, and Cathleen Norris, of the University of North Texas, regarding their mobile learning research initiatives. Their strong contention is that students will bring their mobile phones to school to learn — and it will happen a lot sooner than we think. It's inevitable, they say, and educators need to get with the picture. By Therese Mageau. The National Association of Secondary School Principals is looking to change the conversation about mobile computing and social media in schools. A bring-your-own-laptop pilot program puts an Ohio district closer to its goal of getting a computer into the hands of each of its students. NYSCATE, the New York State Association for Computers and Technologies in Education, will be training teachers on Android- and Windows-based tablets this summer. Teacher professional development provider Teachscape has brought Classroom Walkthrough to the Android platform. As a middle school reading specialist in Oregon's Eugene School District 4j, Marilyn Williams found that many of her middle school students weren't finishing their reading or remembering what they read. So she decided to tackle the problem with the help of iPod touch devices. Assistant Principal Patrick McGee explains that whatever the other advantages of adopting iPads and iPods in the classroom, the key is student engagement. As educators continue to weigh the many considerations attached to allowing student-owned handheld devices on campus, Speak Up asked parents what good they think the use of mobile technologies would have on their children's education. The mobile technology market is blooming with powerful applications that have the ability to transform education with the ease of a download to any number of handheld devices. To learn what apps educators are finding most valuable to teaching and learning, we asked presenters from this month's Florida Education Technology Conference (FETC) to share some of their favorites. The NEA Foundation is expanding the focus of its Challenge to Innovate (C2i) grant program. In the latest phase, the foundation will award five grants to support innovative ideas for using smart phones in the classroom. Over the next five years, six technologies will have a profound impact on teaching and learning--and some are already beginning to have an impact. Students at Philadelphia’s Stephen Decatur Elementary school will have access to a new iPad lab when they return to class in the fall. Renaissance Learning has released a free iOS app that lets students take their Accelerated Reader quizzes on their iPads, iPhones, and iPods. Mobile software company Pocket Watch has released its cloud storage management application, ActiveCloud 1.0, for iOS. 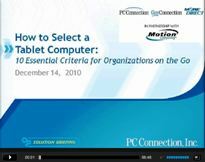 Learn 10 essential criteria that organizations should consider when choosing a tablet computer.